The top down shooter genre is getting quite crowded on the PlayStation Store, so each new release is going to have to really work for our money. At over £10, Alien Breed: Impact is reallygoing to have to work for it. 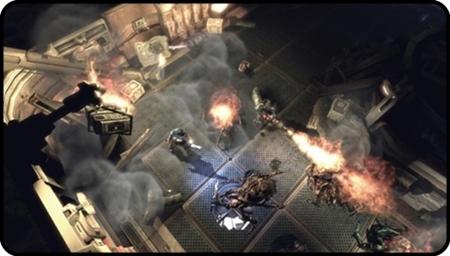 The game takes place on a huge space vessel overrun by aliens. Most of the crew are dead, you’re the only hope yadda yadda. The atmosphere owes a lot to Dead Space, but hey you might as well borrow from the best. You poke through many darkened tunnels with your torch, catching glimpses of crew members being dragged into vents and avoiding random explosions and aliens bursting out of the floor and walls. There’s even a level on the outside of the ship with similar space-vacuum atmospheric noises. The graphics are all well-detailed and lit dimly to enhance the creepy atmosphere. Controls use the familiar twin-sticks to move and aim from the overhead angle. Taps of L1 and R1 will rotate the camera 45 degrees at a time, this can be really slow if you like keeping the camera behind you and you keep getting attacked from behind. An option to flip through 90 degrees at a time would have fixed this. The shooting is solid enough though, thanks to some nice weaponry and a cool laser-sight for targeting. You have a pistol with infinite ammo that’s best used for small crawler enemies or against small numbers of larger beasts to conserve ammo for your other weapons. The assault rifle has a large magazine capacity to dish out the pain for large groups of enemies, the shotgun is great for close one-hit-kills and the flamethrower is good for, well, just fun really. Near the end of the game there’s a laser rifle (laser version of assault rifle) and the Ion Spike which is a badass laser that wipes out wide areas of anything you point it at. The pistol aside, all weapons can have their reload times shortened, damage enhanced or firing rate increased at the stores, where you can also buy health packs, ammo, stun/frag grenades or auto-turrets. The aliens are basic in design, but smoothly animated. We have the usual cat-sized crawler, then the bigger varieties that bite, spit or ram you. Other nasties include one that casts a protecting barrier over other aliens and larger ones that try and block your shots. Generally though, you can take any of them down with any weapon. So far so good, yet so standard. Which is pretty much where the rest of the game is heading. You need to constantly rifle through lockers and the pockets of the dead to find ammo and health. It’s just so annoying that most of them are empty and you have to take time for the ‘searching’ bar to fill by holding down X for every single search. Shooting aliens and holding X is all that you do in this game. Every level involves hacking a computer, restoring power, restoring the mainframe or restoring oxygen, all done by running up to a console and holding X until it’s done. Five levels of that in samey environments really starts to drain your enthusiasm. The lack of variety for the levels could be forgiven as being ‘retro’ if the game at least included a boss at the end of every level. Nope, you run away from a larger alien for a few seconds early on but that’s it. There is a boss at the end of the game, but it was miserably lame and simple and a poor way to finish things off. The game does do some things well though. The action is well-balanced, as apart from the repetition of it all, I never got really bored as the game keeps throwing enemies at you and the waypoint system on the map means you won’t get lost and you always know where you’re headed next. Two player co-op threatens to add an extra point to the final score, almost. It’s not a drop-in co-op for the single player game, so friends can’t pick up a pad and help you out. Co-op has its own handful of separate missions playable locally or online (not a soul online at time of writing). Offline co-op is fun at first, but then the repetition begins to set-in, meaning play sessions won’t be lasting for long. The Short Version: Although the game keeps going at a steady pace it’s just a bit disappointing it’s just the same over and over again. Co-op can give you a few extra hours of play, but there’s nothing here to make this stand out in a crowded genre. Try the demo on PSN before you commit to this pricey shooter.